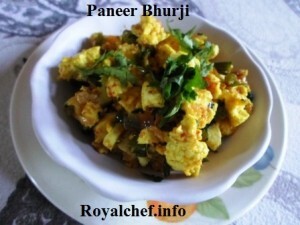 This is a Recipe for preparing at home tasty Paneer Bhurji. The Paneer Bhurji preparation is almost similar to that of the more famous Anda or Egg Bhurji and this preparation for the main course can be called as the vegetarian counterpart of the Anda Bhurji. 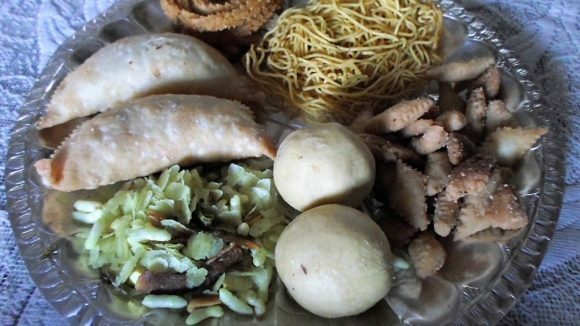 It also makes a good packed meal dish for Tiffin Boxes. The preparation method is given in a most simple to understand and step-by –step manner so as to make the preparation of the Paneer Bhurji at home as easy as possible. Chop the Onion, Tomato, Coriander, and Green Chilies and keep them aside. Chop the Cabbage, Capsicum, and keep them aside. Shred or crush the Paneer and keep it aside. Heat the Oil in a Kadai, add the Onion, Tomato, Ginger-Garlic Paste, Cabbage, Capsicum, and Green Chilies, and mix it well and sauté for 5 minutes on a slow flame. Then add the Red Chili Powder, Salt and Garam Masala and mix it well and after that add the Paneer and the Coriander and mix it well. Serve hot with Bread or Chapati.